Mother Nature celebrated the 10th Anniversary of the Ida Lewis Distance Race by sending winds up to 25 knots and big waves, challenging the record 47-boat fleet and forcing 12 to retire. Nevertheless, the popular overnighter, which started at 12:30 pm Friday, August 15 off Fort Adams in Newport, RI, delivered plenty of memories for the IRC, PHRF, Doublehanded and Multihull competitors on the 150-nautical mile “Block Island” course. The 37.65-nautical mile upwind leg from Buzzards Bay to Montauk Point proved tricky for the entire fleet, including Kevin McLaughlin’s custom 50 Crazy Horse (Fairhaven, MA), on which a team representing Duquesne University won the separately scored Collegiate Challenge. Crazy Horse finished second in PHRF behind Tristan Mouligne’s Quest 30 Samba (Boston, MA), winner of Lime Rock Trophy for best corrected time in PHRF. “It was quite a challenging leg for our entire team, but we got through it fine,” said McLaughlin, whose crew of seven included four college sailors. The team was awarded the William Tuthill Memorial Trophy for their Collegiate Challenge win, and the Lois J. Muessel Memorial Trophy for best elapsed time in PHRF. “The team did an excellent job,” McLaughlin continued. “With the exception of one, all the college kids we had onboard have done long distance races with us. Two of them did the Newport Bermuda Race on Crazy Horse earlier this year.” To qualify for the Collegiate Challenge, more than 40% of the crew had not turned 26 prior to August 15. Ed Cesare and Chad Corning sailed the Class40 Pleiad Racing (Norwalk, CT) to victory in the 6-boat PHRF Doublehanded Division, while Bill Clavin’s C&C 37 R/XL Duck Soup (Warwick, RI) topped the 7-boat PHRF Cruising Spinnaker Division. Van Liew and Bob Goss comprised the “adult” portion of Odyssey’s crew. “The youth sailors we had with us were very competent,” said Van Liew, noting that “The Ida” is a fantastic steppingstone for young sailors transitioning into longer offshore races. 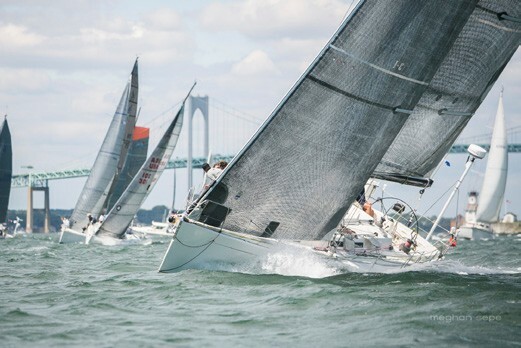 “This is a star event and one I am going to put on the schedule for next year.” The Ida Lewis Distance Race is hosted by Ida Lewis Yacht Club in Newport, RI. For more information, visit ildistancerace.org. Kirsten Ferguson at Media Pro International contributed to this report.